One day before James K. Polk's inauguration as the nation's eleventh President, Congress passed the Post Office Reform Act of March 3, 1845, which greatly simplified and reduced postal rates, effective July 1, 1845. The Act was signed by President John Tyler on his last day in office, which left the task of implementing the reform measures in the hands of Polk's new postmaster general, Cave Johnson (1793-1866). Johnson, a Democratic congressman from Tennessee since 1829, had been among the opponents of the Cheap Postage movement, arguing that such a drastic reduction in postage rates would financially cripple the postal system and increase the risk of privatization. Now, as postmaster general in President Polk's cabinet, Johnson was responsible for making sure the nation's postal system provided the same level of service, despite the reduction of rates and the significant curtailment of franking privileges and transportation subsidies. The profound changes in the nation's postal system effected by the 1845 Post Office Reform Act set the stage for the introduction of adhesive stamps to prepay postage. The concept had been successfully implemented by Great Britain in 1840 and proposed in Congress by Senator Daniel Webster in the same year, but authorization to issue stamps was withheld by Congress until March 3, 1847. Siegel Auction Galleries, 1970 Rarities of the World, 3/24/1970, Sale 371, lot 22, described as "From a new Original Find"
Malcolm L. Brown census (Chronicle 171, August 1996, page 156), where described as "Positions 91-98L (?)" The 5¢ 1847 Issue printings and the myriad colors they produced have vexed specialists attempting to classify them, as far back as the early 20th century when Dr. Carroll Chase described shade varieties in words, without the benefit of full-color publishing. In more recent times, Calvet M. Hahn and Wade Saadi have tried to describe the shades and illustrate them with color images. They have also attempted, with mixed results, to attribute shades (and impressions) to specific deliveries and/or printings. The 5¢ stamps in a distinct orange hue are assigned Scott numbers 1b (Orange Brown), 1c (Red Orange) and 1d (Brown Orange). Philatelists have been left to decide which listed shade applies to a stamp at hand. Complicating matters, there is no clear consensus on the spectrum range for each shade, which results in great differences between two stamps presented or certified as the same Scott number. The strip offered here is an unequivocal Orange Brown. 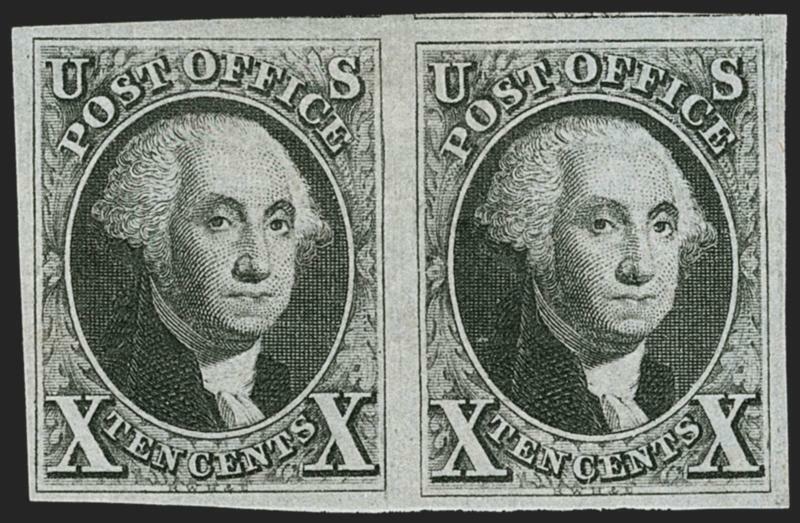 It is a brightly tinted shade, and the impression is pronounced, but the lines of engraving show wear and fuzziness, which is most evident in the lines of the oval background surrounding Franklin's portrait and in the fine lines along the outside portions of the rectangular design within the framelines. The overall impression indicates that this was probably a late printing, circa 1850-51, made from the cleaned and reworked plate, a process used by Rawdon, Wright, Hatch & Edson to improve the quality of prints made from the well-worn plate after years of use. 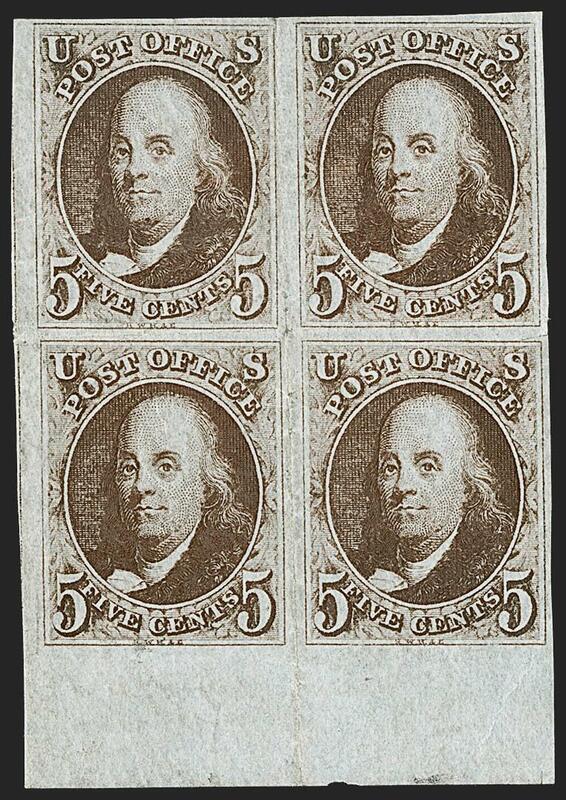 In anticipation of the new July 1851 rates and stamps, Postmaster General Nathan K. Hall announced on June 11 that the 5¢ and 10¢ postage stamps of 1847 would no longer be accepted as legal postage after June 30, 1851. Postmaster Hall's demonetization order established a three-month redemption period--from July 1 to September 30, 1851--and instructed the public to present the stamps "to the Postmaster of whom they were purchased, or to the nearest Postmaster who has been authorized to sell postage stamps." Hall specified that only postmasters who had previously received stamps for sale directly from the Post Office Department were authorized to "pay cash for all genuine postage stamps" (Thomas J. Alexander, "Demonetization of the 1847 Issue," Chronicle 174, May 1997). The procedure for redeeming unused 1847 stamps was cumbersome for the public and for postmasters. In the months following June 30, 1851, there was a degree of tolerance for use of the old stamps, as evidenced by dozens of covers with 1847 stamps used in the post-demonetization period. However, as time passed, the floating supply of old stamps dwindled, and it undoubtedly became more difficult to slip the 1847 stamps into the mails. Furthermore, paying the 3¢ domestic rate with a 5¢ 1847 stamp wasted 2¢. The USPCS census of covers with 1847 stamps shows a steep decline by the end of 1852. The Philatelic Foundation (1982) "genuine cancelled in Panama"
The Philatelic Foundation (1991) "genuine with red grid cancellations which were used in Panama"
United States Post Office Department records of 1847 stamps distributed to post offices indicate that 25 sheets of 10¢ 1847s (2,500 stamps) were sent on June 22, 1850, to A. B. Corwine, the official U.S. mail agent in Panama City. Corwine received the stamps on July 16. Another 25 sheets (2,500 stamps) were sent to Corwine on January 17, 1851, and received March 21. No 5¢ 1847s were ever sent to Panama, since the standard rate was 30¢ per half-ounce. Corwine served as the American commissioner in Panama until Lincoln removed him from office. He was an instrumental figure in the so-called 1856 Watermelon War, when inebriated Americans in transit antagonized a local seller of watermelons by refusing to pay, leading to riots--the vendor pulled a knife, the antagonist pulled a gun, a struggle ensued, and a bystander was shot. Corwine's report of the incident was instrumental in the following short American occupation of the Isthmus, as well as payment of compensation and justification for future military actions to maintain the neutrality of Panama. The 10¢ strip offered here was originally found used on a letter from Lima, Peru, addressed to Tepic, Mexico, and sent via the U.S. mail agent at Panama and via Mazatlan. The stamps and letter never touched United States territory during this journey, but the 30¢ postage paid for official U.S. mail transport from Panama. According to Ashbrook's account, when the cover was discovered, it was "a bit ragged." After it was owned by Representative Ernest Ackerman and Henry Gibson, the next owner, Judge Robert Emerson, removed the strip and placed it in his "Deluxe Collection of the 1847 Issue." At the 1946 sale of this portion of Emerson's collection, it was acquired by Saul Newbury for a staggering price of $2,900. In the October 1963 Newbury sale (Part 6) held by Siegel, the strip realized $3,500, one of the four highest prices in the auction, including the famous 1¢ 1851 Type I Newbury cover, which sold for $12,000, and the 15¢ Z Grill discovery stamp, which sold for $11,500. 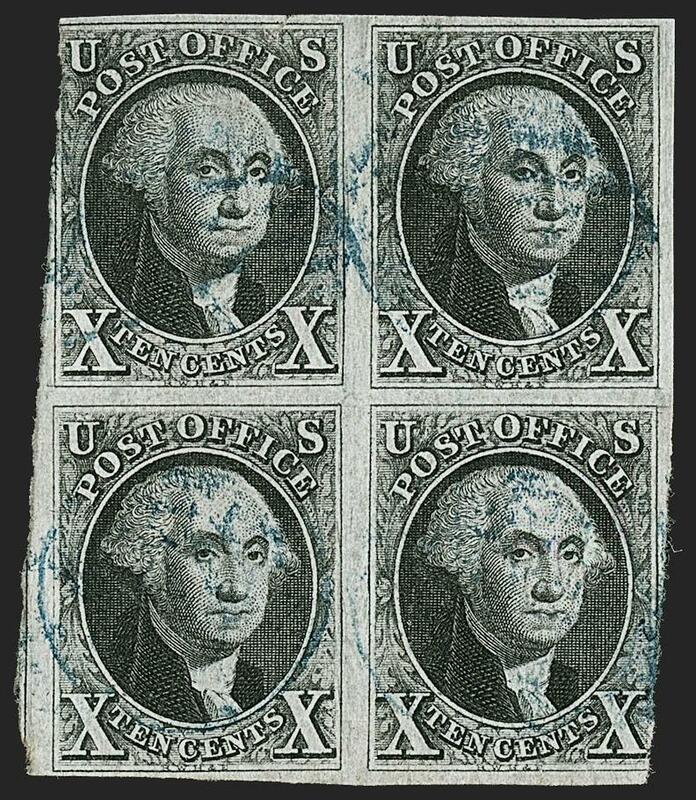 The block offered here is one of two used blocks of the 10¢ 1847 Issue in private hands, and it is the only privately held block with handstamped cancellations, as opposed to pen cancels.